New York may be the city that never sleeps but London is fast becoming a 24-hour city where you can shop, drink, dance, travel and even get a culture fix from dusk till dawn. But where should you head to refuel after all these nocturnal activities? We round up the city's best late-night food joints for when you have the midnight munchies. This 24-hour East End institution has been serving freshly baked bagels to London's late-night revealers since 1977. The ovens churn out soft bagels all day and all night long and they're boiled before being baked. Opt for a classic cream cheese filling or plump for a popular salt beef-stuffed bagel. Whatever you choose, you can refuel at this Brick Lane snack stop for less than £5. When? Biegel Bake is open 24 hours a day. Where? The nearest tube station is Shoreditch High Street. Where? The nearest tube station is Farringdon. This bustling bistro in west London is the city's oldest all-night restaurant. It has a 24-hour booze license, a party vibe and serves classic comfort food dishes from dusk till dawn. Full English breakfast is available 24 hours a day and at night you can dig into meals like fish and chips and club sandwiches. A nominal cover charge applies for meals served after midnight. When? Vingt-Quatre is open 24 hours a day. Where? The nearest tube station is South Kensington. If you're keen to carry on the party but can feel your energy levels flagging, hot foot it to the Royal Dragon in Chinatown, a late night karaoke and dim sum den. Go with a group and book out a private karaoke booth and fill up classic Chinese dishes including hot pots, noodles, and BBQ dishes. Or keep things light and snack on dreamy dumplings. When? Royal Dragon Restaurant and Karaoke is open until 3 am every day. Where? The nearest tube station is Leicester Square. 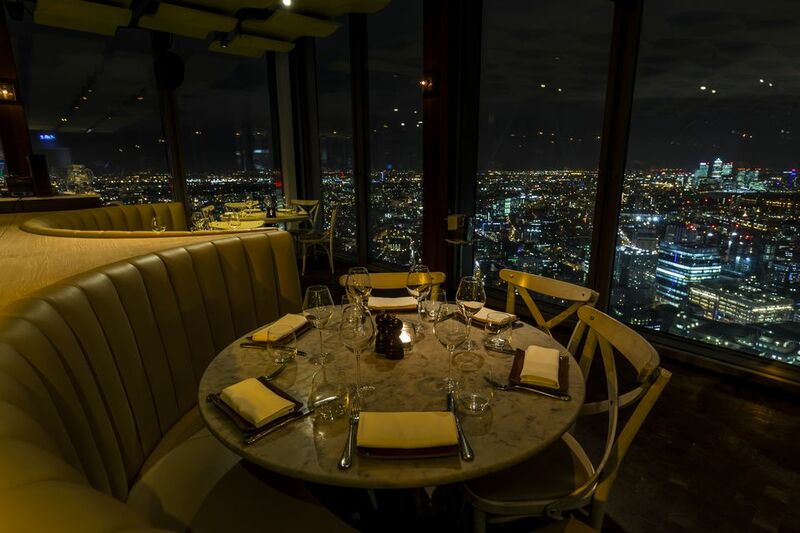 Between Liverpool Street and the skyscraper affectionately known as the Gherkin, Duck & Waffle is a 24-hour sky-high dining spot that offers jaw-dropping views and mouthwatering food for midnight feasting. Head up in the glass elevator to the 40th floor and take a seat in one of the leather banquettes or at a table by the floor-to-ceiling wraparound windows. Go on an empty stomach if you're looking to try the signature dish of waffles stacked with crispy duck leg confit served with a fried duck egg and mustard maple syrup. When? Duck & Waffle is open 24 hours a day. Where? The nearest tube station is Liverpool Street. To spice up your night head to Ranoush Juice on High Street Kensington, a fast food restaurant that serves tasty kebabs and mezze dishes until 2 am every day. The late-night Lebanese menu features traditional shawarma, chargrilled meats and tons of hot and cold mezze dishes. If you need a pick-me-up, order a potent Arabic coffee and a sweet, flaky pastry on the side. When? Ranoush Juice is open until 2 am every day. Where? The nearest tube station is High Street Kensington. Owned by Soho House, this hipster pizza joint is located in a converted tea warehouse in Shoreditch. The industrial chic spot attracts a creative crowd and late night carb fans as it's open until 2 am on Fridays and Saturdays. Naturally, pizzas are the star of the show but you can also order pasta dishes like mac 'n' cheese and beef lasagne. When? Pizza East is open from 12 pm until 12 am Monday to Wednesday; 12 pm until 1 am Thursday; 12 pm until 2 am Friday; 9 am until 2 am Saturday and 9 am until 12 am Sunday.